The Saskatchewan provincial government has released the results of an online survey on marijuana legalization. The federal government is pushing for a legalization date of July 1, 2018, prompting many provinces to draft plans around who can sell pot and when. While Saskatchewan has yet to release its strategy, it has come out with the results of an online survey conducted in September and October that asked people across the province how they thought legalization should be handled. The survey received almost 35,000 responses, the most of any survey the province had previously run, the province said. Here is a sample of its results. According to the survey, 45.2 per cent of respondents wanted a government-run retailer to sell marijuana, much like the Saskatchewan Liquor and Gaming Authority. 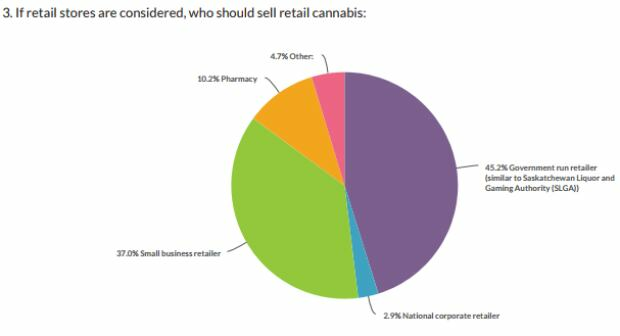 Thirty-seven per cent of respondents believed small businesses should sell marijuana. 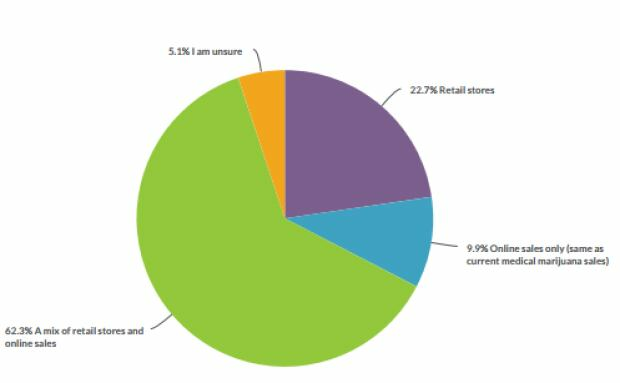 The majority of people in the survey also wanted a mix of retail stores and online sales to sell cannabis in the province, at 62 per cent. Justice Minister Don Morgan noted that the survey said more respondents supported private retailers when pharmacies and national retailers were included, edging out the number of people who supported a government-run retailer. While the province’s policy has not been released yet, Morgan made it clear that the province is not interested in selling marijuana. Meanwhile, Opposition NDP Leader Nicole Sarauer said there should be more consultation on the issue than an online survey. While towns and cities across the province have asked to have a say in how marijuana is sold, many people in the survey were against that idea. Nearly 58 per cent of respondents either strongly disagreed or disagreed that municipalities should be given the option to more strictly regulate cannabis sales. 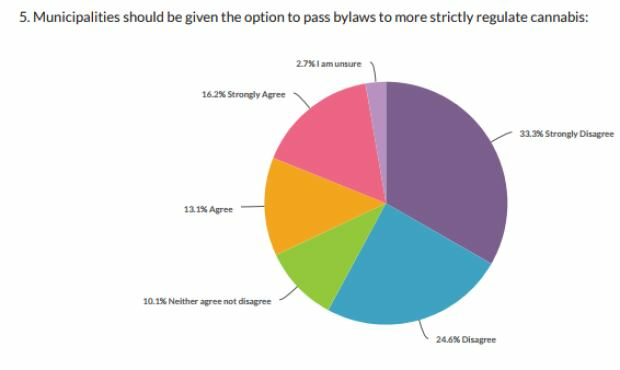 Asked to “indicate what requirements should be considered in developing rules and regulations for cannabis retailers,” 76 per cent of respondents believed there should be rules around whether minors would be allowed on premises where pot is sold, and 78 per cent believed in mandatory training for retail store staff and owners. How old should smokers be? 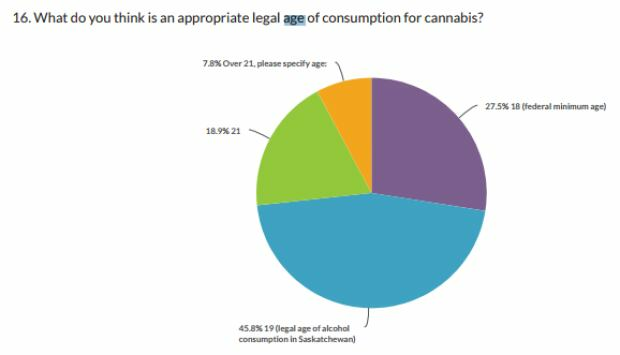 Forty-five per cent of respondents said they want the minimum age to purchase marijuana set at 19, the same minimum age for alcohol consumption in Saskatchewan. The survey said 47 per cent of respondents want restrictions set on the amount of cannabis a person can buy. Asked “Do you feel cannabis consumption should be prohibited in public spaces?” more than half — 53.7 per cent — of the respondents said cannabis use should be prohibited in public spaces (much like cigarettes). People who took the survey also seemed to be concerned about drivers and marijuana use. 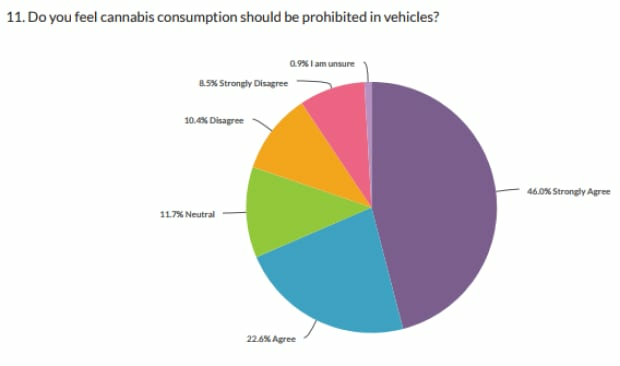 Sixty-eight per cent said cannabis should be prohibited in vehicles. Meanwhile, 57 per cent said there should be zero tolerance for cannabis or any drugs for drivers, no matter their age or licence status. As well, 65 per cent of respondents either agreed or strongly agreed the same penalties for alcohol-impaired driving should apply to marijuana. 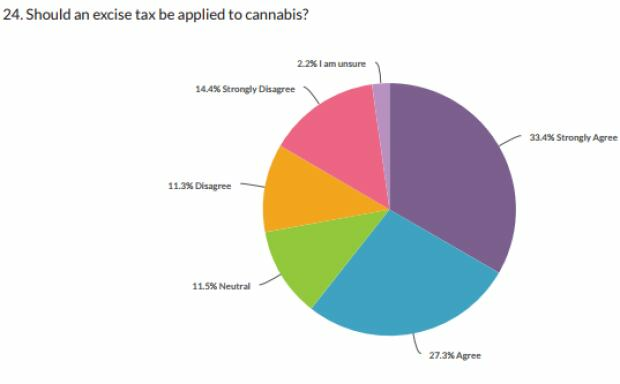 Asked “Should an excise tax be applied to cannabis?” 60 per cent of respondents said such a tax should be applied to marijuana. The majority of respondents said a portion of that tax should go toward mental health and addictions treatment, public education and impaired driving prevention. The survey was conducted between Sept. 8 and Oct. 6, 2017 through the Government of Saskatchewan’s website. Because it is an online survey, no margin of error if available and it is considered non-representative. The province said it would use the information to help guide Saskatchewan’s legislation going forward. Is recreational marijuana about to be legalized in Michigan?